Families are complicated…and some more complicated than others. The people closest to us see the best and the worst of us, and vice versa. Yet even though our family members are such familiar figures in our lives, at times it feels like they’re the biggest mystery of all – particularly when conflicts arise. Could the Gallup StrengthsFinder 2.0 profiling tool help to strengthen family relationships? 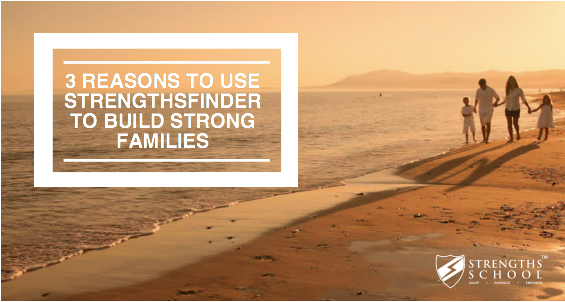 Here are 3 reasons to use StrengthsFinder with your family. Reason #1: It helps you understand your family members on a deeper level. I’ve always known that my mother has an incredible stamina and drive. As a kindergartener, I remember attending her Ph.D. graduation ceremony: she singlehandedly raised me and my younger brother while completing her doctorate in Computer Science. (My dad was mostly overseas for work.) Now that she’s in her late 50’s, she works full time at an MNC as a senior software engineer – and in her free time, she builds, renovates, and sells houses for fun. One of the tenets of the StrengthsFinder philosophy is about catching people doing right. (Tweet this!) When we understand the Top 5 themes of each of our family members, it gives us a solid foundation to get to know how our family members are wired on a very instinctive level. Subsequently, we also learn how each of them uniquely contribute to the family, and we develop a newfound appreciation and respect for their strengths. Reason #2: It gives you a common language to navigate conflicts. Reason #3: It provides practical handles on how to create more meaningful family bonding opportunities. As a Gallup-Certified StrengthsFinder coach, Meiling is passionate about helping people discover their innate potential and celebrating who they are. To that end, she enjoys writing articles and regularly posts on her blog, MeilingTan.com. Meiling is also actively giving StrengthsFinder coaching to individuals and facilitating workshops in Singapore.